Not as many people are moving between states as they were in earlier decades, but those who do move are choosing to move to the South. 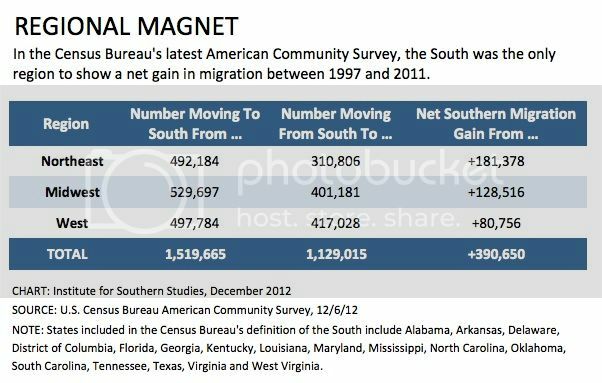 In fact, according to new Census Bureau data released this week, the Southern region of the United States* is the only one to show a net gain in migration over the last five years, growing at the expense of states in the Northeast, Midwest and even the West. The data comes from the American Community Survey, a sampling of 3 million households conducted by the Census Bureau in the years between the decennial census. The latest figures, which reflect trends over the five-year period between 2007 and 2011, show the South as the leading destination for those who have moved between states during that time. Overall, people aren't moving as much. The percent of U.S. residents migrating within or outside their states hovered around 20 percent during the post-World Word Two boom years, tapering off slightly in the 1970s and 1990s. But it plummeted over the last decade, fueled by the economic uncertainty of the Great Recession, reaching a low of 11.6 percent in 2011. But for those who did move, especially in the years leading up to the Great Recession, the South -- along with Western states -- was the most popular destination. Between 2005 and 2007, for example, the South gained a net 1.4 million people moving from the Northeast, Midwest and West. The Census Bureau data has its limitations. Its definition of the South includes such places as Washington, D.C., which demographer William Frey of the Brookings Institution notes is one of the metro areas that has started seeing on uptick in newcomers moving to the area (but which few others would include as a "Southern" area). Because it's only a sample, there's also a decent margin of error. But the overall trendlines show what many Southerners already know: Lots of newcomers, from all over the country, are calling the South home. This, combined with the fact that many Southern states have a high number of what demographers call "sticky" residents -- people who are born in the state that stay in the state -- means that the South will continue to grow, both in size and political clout. * NOTE: As Facing South notes whenever using U.S. Census Bureau data, the Census uses a broad definition of the South that may offer an exaggerated view of the South's size. The Census Bureau's Southern region includes Alabama, Arkansas, Delaware, District of Columbia, Florida, Georgia, Kentucky, Louisiana, Maryland, Mississippi, North Carolina, Oklahoma, South Carolina, Tennessee, Texas, Virginia and West Virginia. In future reports Facing South will offer state-based analysis focusing on the 13 states we typically include in the South (Ala., Ark., Fla., Ga., Ky., La., Miss., N.C., S.C., Tenn., Texas, Va. and W. Va.). IMAGE: Map of migration flows in U.S., 2005-2007 from Pew Research Center, 2009.